Professionals in workplace safety, risk management, HR management, and workplace supervision can get comprehensive and practical guidance to promote understanding and compliance with federal and provincial health and safety laws and standards. With access to more than 100 print resources, staying current with the latest developments and best practices in workplace health and safety is convenient and straightforward. 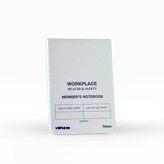 Click here to see Thomson Reuters' selection of print products for your health and safety needs. 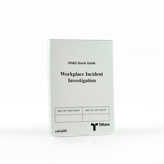 Triform OH&S and Incident notebooks help your organization maintain standards when dealing with health and safety risks. Health and Safety notebooks provide front line officers with quick references to OH&S guidelines, note taking hints, investigation and incident reporting standards and first aid/CPR performance and much more.